What may have looked like a simple meal being served was a prayer answered for 436 homeless and low-income Portlanders on Sept. 24. “Thank you,” a lunch guest at the Blanchet House said to Portland Mayor Ted Wheeler as he set a plate of pasta, apples and salad in front of her. The mayor and his staff volunteered plating food and bussing tables. 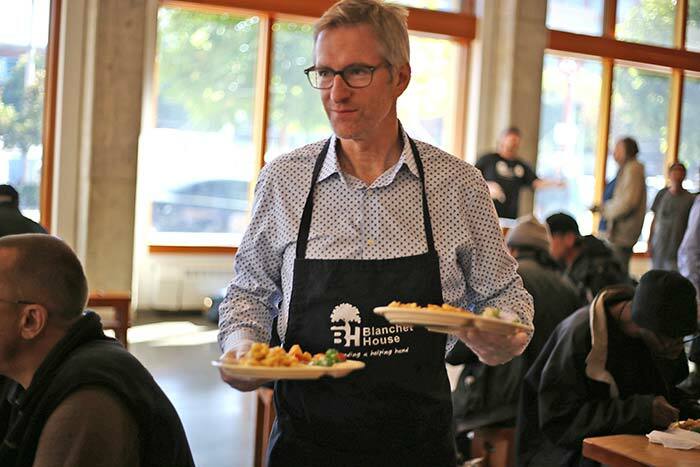 “I encourage all Portlanders to volunteer a few hours of their time and serve a meal at the Blanchet House,” said Wheeler, who has been grappling with how to handle the growing problem of homelessness in the city. Blanchet House, named after the region’s first Catholic bishop, has been addressing the problem since the 1950s with food, shelter and job training.